Organic snacks are perfect for children. 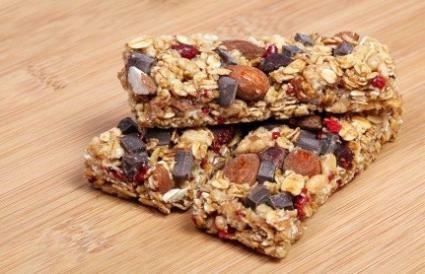 If you need a high energy snack, an organic chocolate chip granola bar recipe may be just what you are looking for. With lots of healthy fiber, organic ingredients, and high quality carbs, this portable snack can keep you going on a hike or during afternoon blood sugar drops. Organic granola bars are great for packing in school lunches, on hiking trips, or just having around the kitchen for when a snack attack hits full force. There are thousands of recipes for the bars on the Internet and they are easy enough to make that there really is no need to buy them. Just remember that you can make any recipe organic by simply substituting organic ingredients for the conventional ingredients called for in the recipe. You should be able to find most of the ingredients called for at your local health food store, if not at the grocers. You can also check online. Keep your costs down by buying in bulk when you can. The granola bar recipe is sweetened with honey to help your body avoid the crash that can come with white sugar. Be sure to use all organic ingredients to end up with a totally organic product. The number of bars you get out of this will depend on the size you cut them. Grease a 13 x 9 pan. Toast the oats on an ungreased cookie sheet for 15 minutes, stirring often. Combine the remaining ingredients in a mixing bowl. Spread in the pan and press down firmly. Bake 25 minutes, or until golden brown. Cool and cut into bars of the desired size. This organic chocolate chip granola bar recipe is full of chunks of chocolate and has the added energy and flavor of peanut butter. Best of all, you won't have to bake it. Heat the honey, turbinado, and peanut butter to a boil. Boil for two minutes. Remove from heat and add the rest of the ingredients, stirring to coat all. Press firmly into the prepared pan and cool. The addition of organic coconut not only adds flavor to these bars, but it helps to keep them moist and chewy. Mix all ingredients and press into the pan. Cool for 10 minutes and cut into bars. Allow to finish cooling completely. Your homemade granola bars should be fine at room temperature. Keeping them in the refrigerator will cause them to lose some of the crispness. To store them, just cut into bars and wrap tightly in plastic wrap for individual servings. You can also keep them in an airtight, food grade container on the pantry shelf. The bars should keep for up to a week in a cool, dry place.